In Area 5 the morning sun, got the birds singing. The song of the Dunnock is a hidden treasure. This small, brown and grey bird delivers a quick, delicate, scratchy chorus.Also singing were Song Thrush , Blackbird and Robin . At around 07:00 today and yesterday a small group of Canada Geese flew over Area 5 heading S calling. In Area 4 this morning over Paul Bright Thomas's garden were 2 Herring Gull heading SW and 2 Cormorrant heading NW. 2 Canada Geese flew in from Area 5 circled the Area 4 Balancing pond and then headed off E calling. 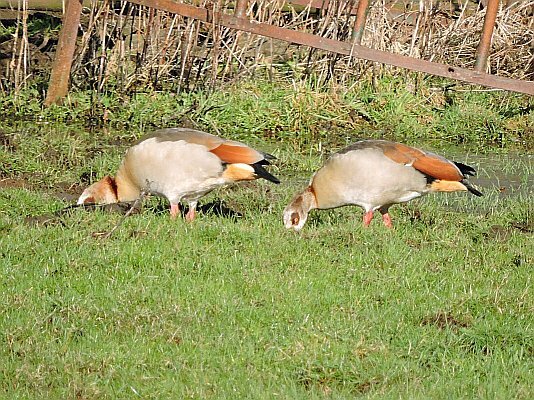 Seen by Paul Bright Thomas were 2 Egyptian Geese flying NE over Area 4. A solitary Common Gull Area 4 seen by Paul Bright Thomas. Seen from his Area 4 garden a Little Egret was seen flying at tree top height along the Emm , toward the Balancing Pond by Paul Bright Thomas. Also seen were 12 Magpie together. Waking up early I sat in my Area 5 garden at 06:30 with a cup of tea and was treated to the spring dawn chorus. At least 2 Song Thrush were singing against each other,a Blackbird and Robin were also joining in. As it got light Wood Pigeon were showing off their display flight. During spring, male Woodpigeons perform display flights to advertise their breeding territories. Individuals soar steeply upwards, sometimes clapping their wings together once or twice in mid-air, then gliding down with their tail spread. 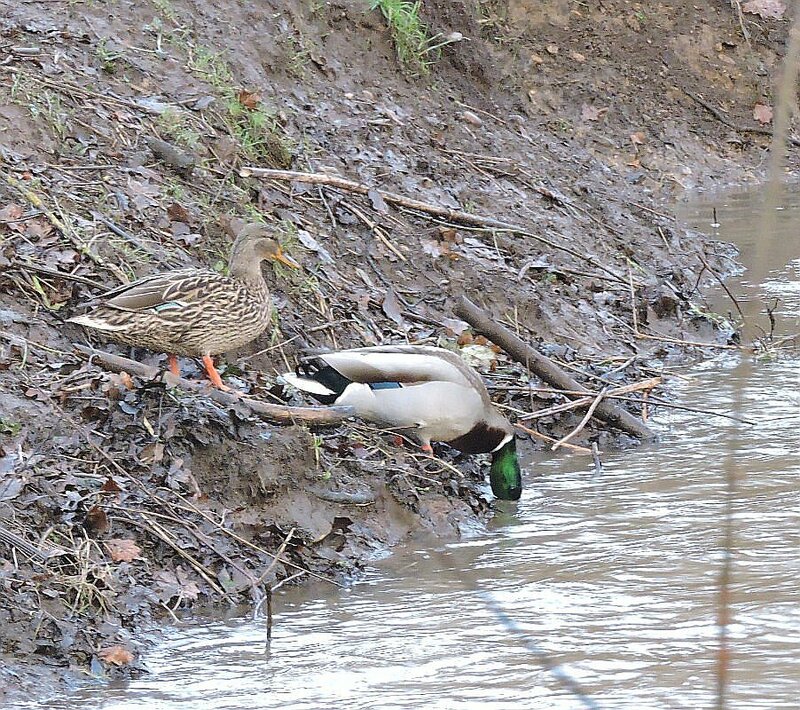 Following the previous nights the Emm was in full flow and a pair of Mallard decided to test the water before jumping in. A lunch time stroll around Area 2 was quite productive despite the bitter wind.The fields of Ludgrove School held good numbers of Redwing with at least half a dozen Lapwing in the flock. 3 Mistle Thrush and 2 Egyptian Goose were also seen nearby. Around midday the Wood Pigeons exploded from an Area 5 tree. Checking the skies a Sparrowhawk was seen gliding through the area. A bit later at about 15:00 in Area 4 Malcolm Dunmore watched as possibly the same bird took 40 mins to polish off a Starling that it had killed in his garden. A snowy walk to work this morning was brightened with a male Bullfinch with its red breast easily seen against the snow covered bush. A cold start to the month in Area 5 . 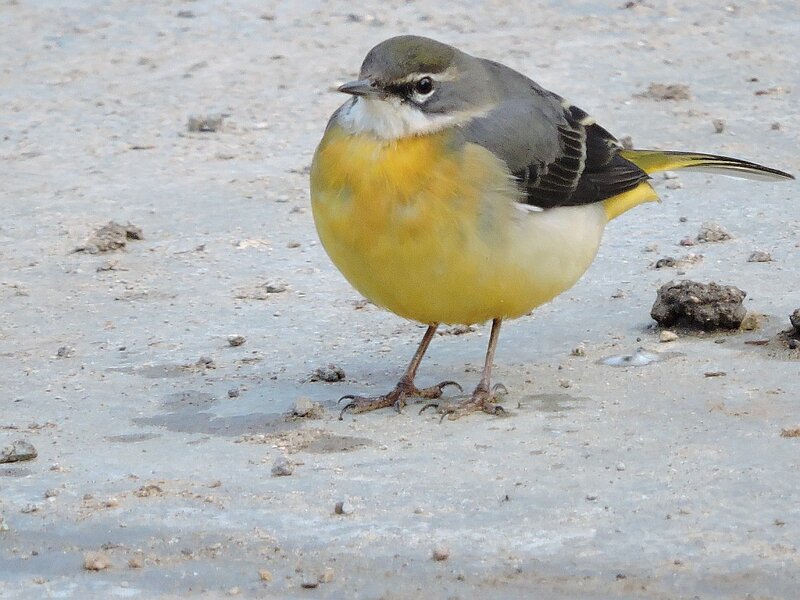 A Grey Wagtail was at the Balancing Pond feeding at the new grille. Green Woodpecker was heard calling. Thrushes in the shape of Redwing , Mistle Thrush and Song Thrush were also seen. 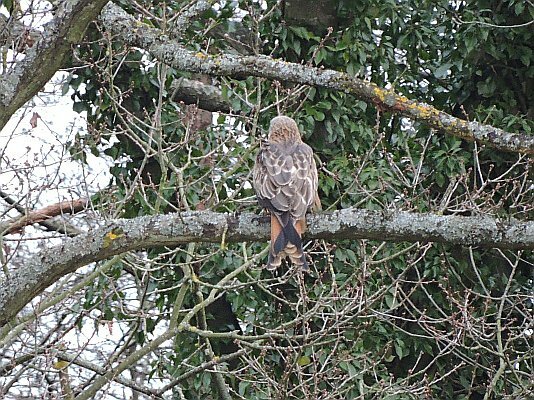 A Buzzard was perched in the tree's near Woosehill Roundabout. A stroll in Area 2 around by Ludgrove School in the afternoon produced even more Winter Thrushes with Redwing , Fieldfare, Mistle Thrush and Song Thrush feeding in the fields. A camera shy Red Kite was in the trees and a Sparrowhawk was flying over the area. A Grey Heron was feeding in the wet fields..
Todays afternoon sunshine lured a few Insects out into Area 5. 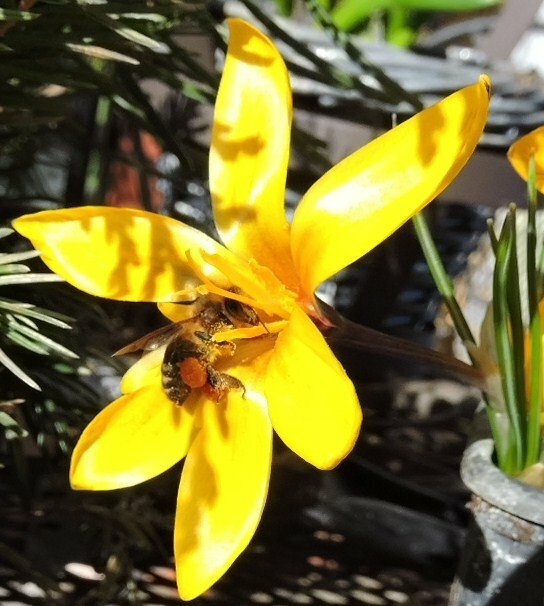 The first Buff tailed Bumblebee Bombus terrestrius of the year was seen along with the Marmalade Hoverfly Episyrphus balteatus . It may be the commonest and most widespread hoverfly in Britain.Its two 'moustache' black bands on tergites 3 and 4 of its abdomen are unique. Some specimens also show white bands on the abdomen, whilst other forms are quite dark. Also seen was the Honey Bee Apis mellifera with full pollen baskets. 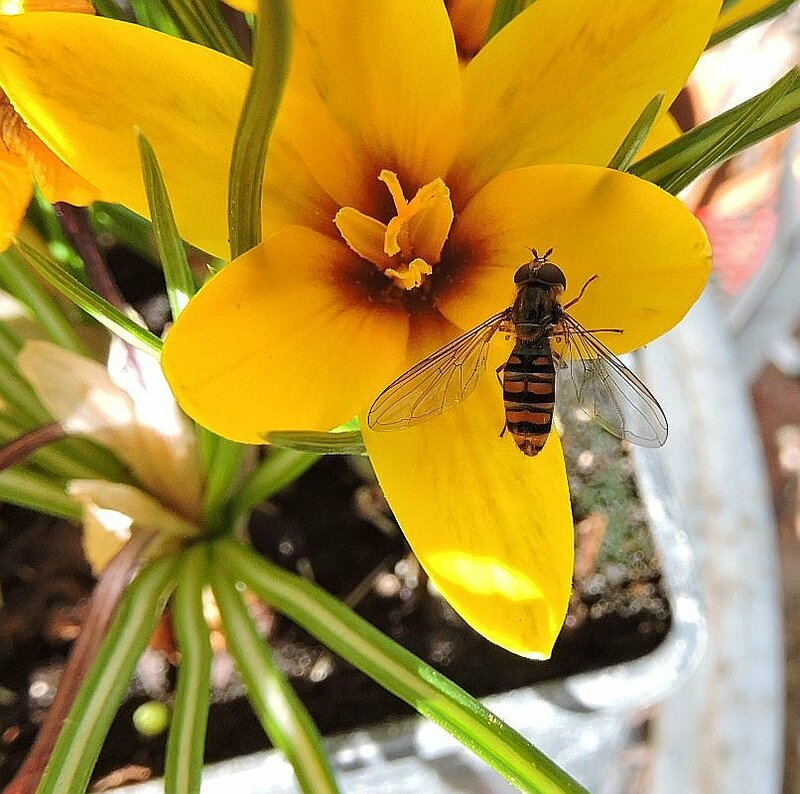 The pollen basket or corbicula is part of the tibia on the hind legs of certain species of bees. The lack of leaves on the tree's reveals old Oak Marble Gall's . 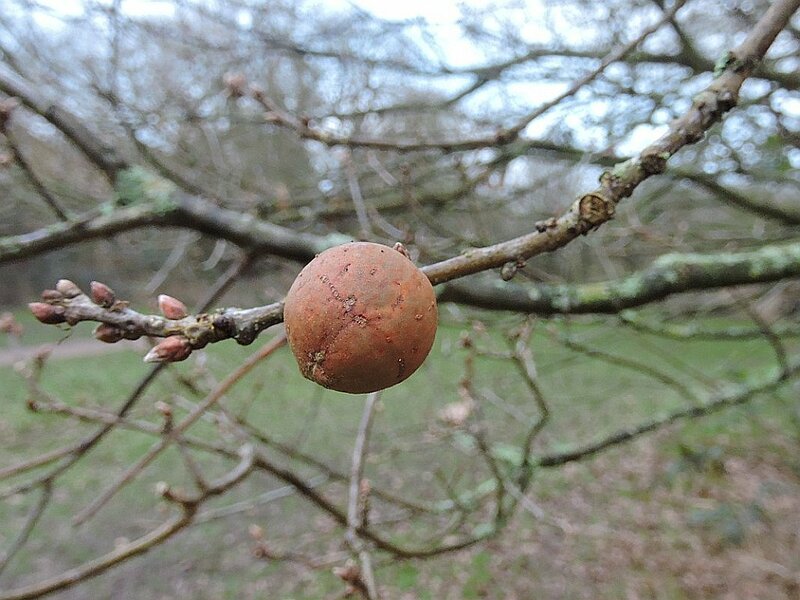 The gall is caused by a tiny gall wasp, Andricus kollari .Clusters of Oak Marble Galls can be found on oak twigs. They turn brown as they mature and emergence holes, from which the asexual adults have escaped, can be seen from autumn onwards. 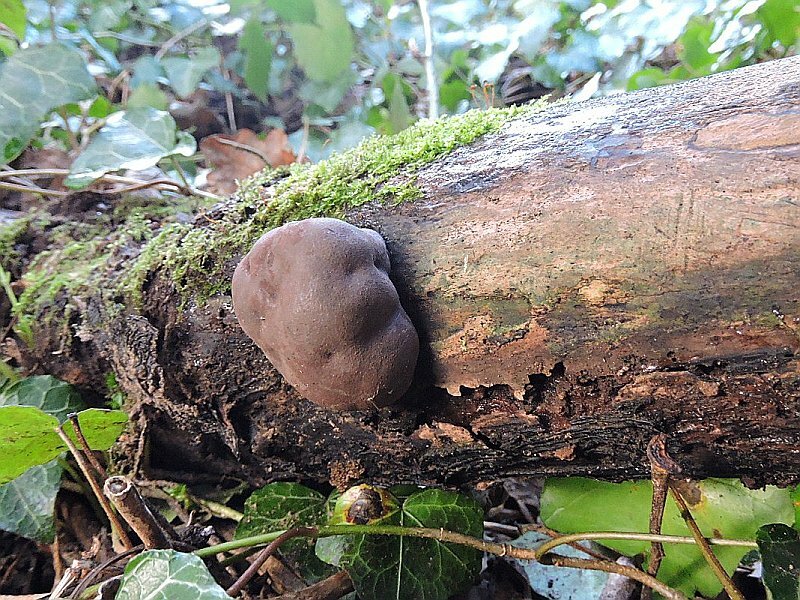 The empty gall is left on the twig. The emerging females then lay eggs in the buds of Turkey Oaks which develop overwinter and emerge in spring as a sexual generation of males and females, ready to make the familiar summer gall. In Area 5 Lesser celandine Ranunculus ficaria is a cheerful sight with its shiny, buttercup yellow flowers. Lesser celandine is a perennial member of the buttercup family. 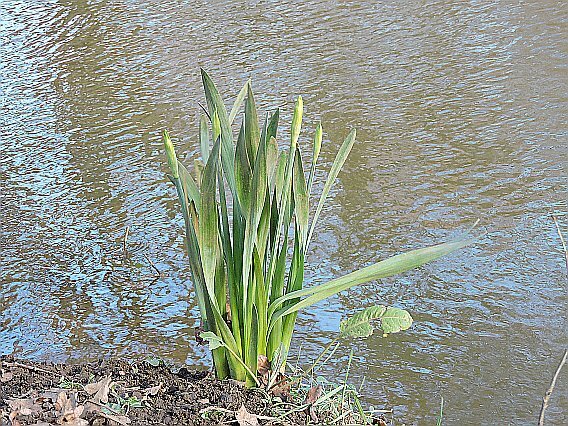 This plant usually appears above ground in late February and usually dies back in late April. 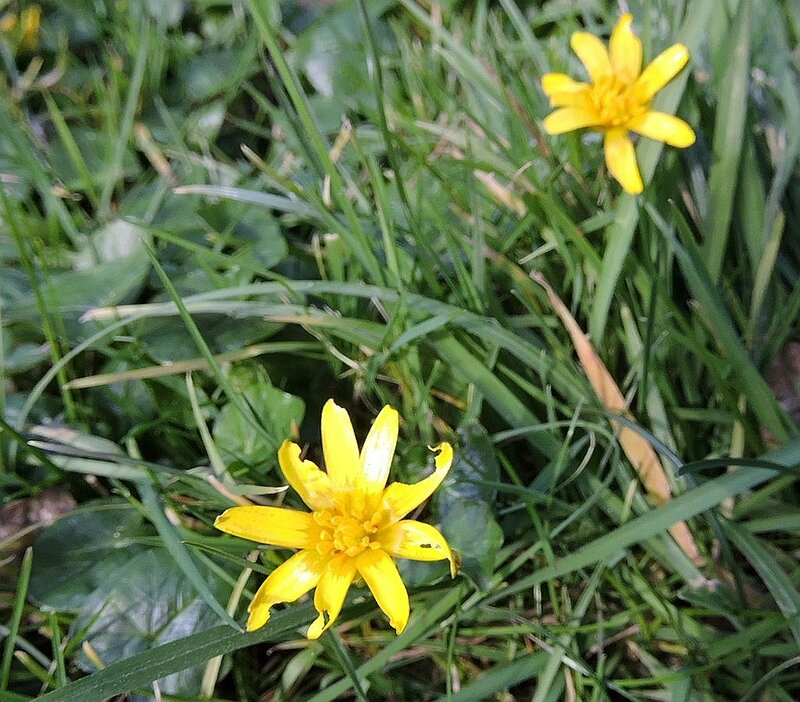 Lesser celandine is a low-growing plant, rarely reaching more than 5cm (2in) in height. It has glossy, heart-shaped leaves and bears shiny, bright-yellow flowers in March or April. In Area 8 Gorse Ulex europaeus can be seen, it generally flowers from January to June (although it may flower sporadically throughout the year). 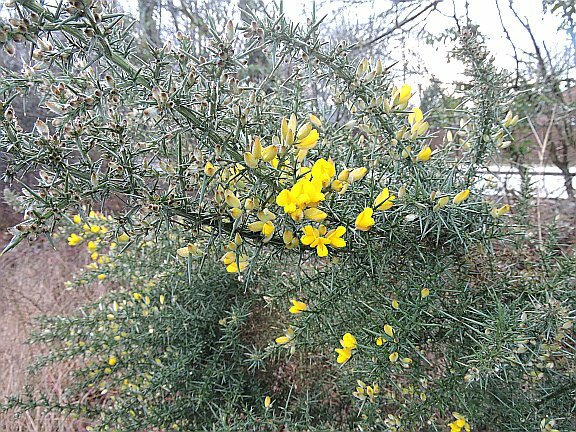 Gorse is a large, evergreen shrub covered in needle-like leaves and distinctive, coconut-perfumed, yellow flowers . 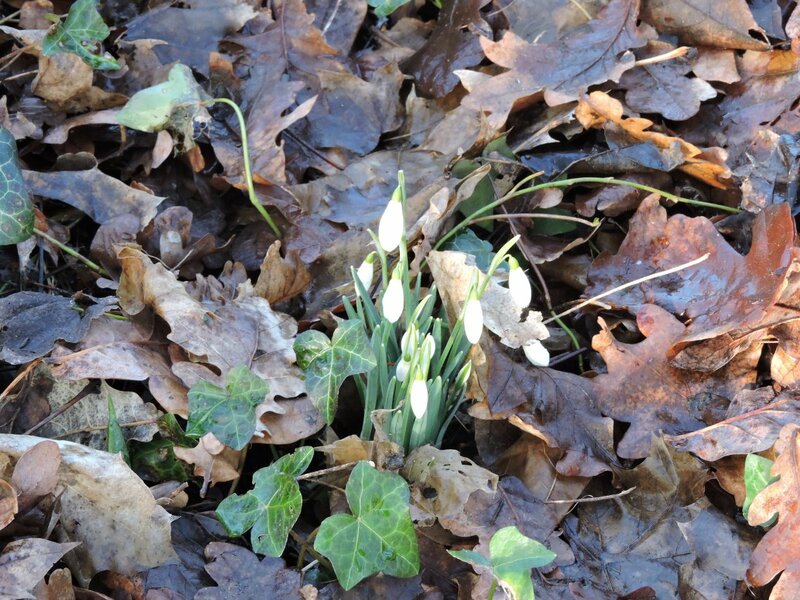 Obviously "Garden escapes" but Snowdop and Daffodils show that Spring is on its way. 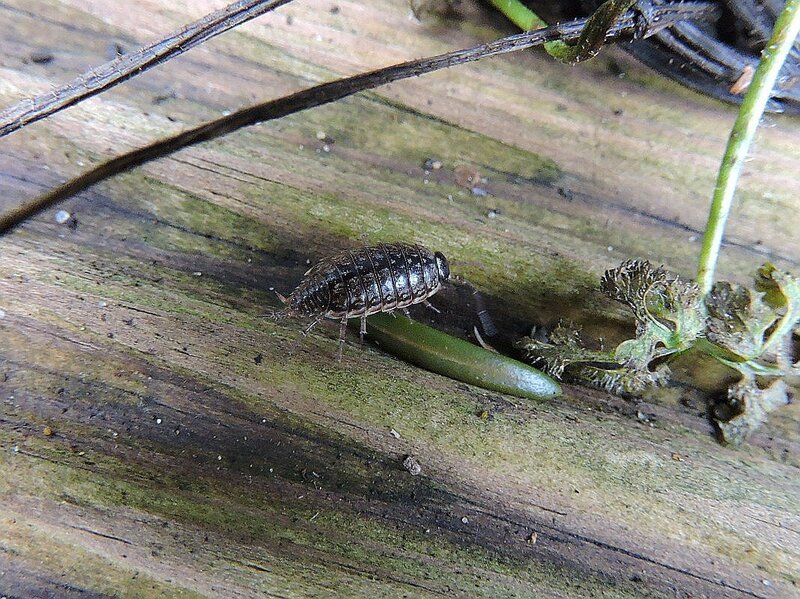 Whilst moving stuff in my Area 5 garden this afternoon I disturbed this Common Striped Woodlouse Philoscia muscorum .The Striped Woodlouse often can be identified by the fact that it is a fast runner (much faster than the other common woodlice). Turning over stoned and logs in very early spring however takes away this disadvantage: they are often too cold to run away that fast. Woodlice aren't insects - they are crustaceans just like shrimps and they still have gills. 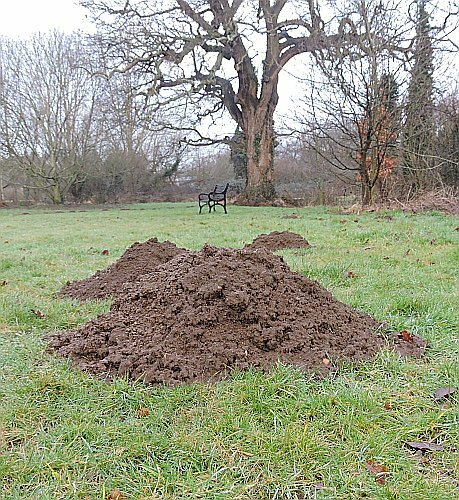 It looks as if a super Mole Talpa europaea has taken up residence in Area 5.